TUSCALOOSA, Ala. — Researchers at The University of Alabama hope to better understand how bacteria and viruses battle each other and, in the process, devise new strategies to combat antibiotic-resistant infections. 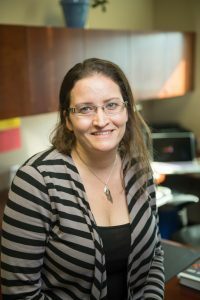 Dr. Asma Hatoum-Aslan, UA assistant professor of biological sciences, was recently awarded a National Science Foundation CAREER Award to continue her work in discovering how bacterial immune systems ward off bacteriophages, or viruses that specifically attack bacteria. The human body hosts all sorts of bacteria and their accompanying phages. In fact, phages are 10 times more abundant than bacteria in every environment tested, and they are all part of what scientists call our microbiome. There is limited knowledge about what transpires between phages and their bacterial hosts within the microbiome. In this project, Staphylococcus bacteria and their phages, both abundant residents of human skin, will be used as a model host-virus system. Hatoum-Aslan and her students discovered a suite of new Staphylococcus phages from local wastewater to use for this research. Historically, research focused on the ongoing battle between bacteria and phage led to groundbreaking discoveries such as the immune system commonly referred to as CRISPR-Cas, which has since sparked a genome editing revolution. CRISPR-Cas systems are sequences of genetic code inside bacteria that also store snippets of phage code. The CRISPR-Cas system uses the stored phage code to “remember” past invaders. When a phage invader with matching code is encountered again, CRISPR-associated enzymes cut apart the genetic sequences in invading phages, destroying them. Scientists are able to manipulate this process to edit genetic code in a wide-range of organisms, including humans. The most commonly used system to date is CRISPR-Cas9, but Hatoum-Aslan is studying the more complex and less understood CRISPR-Cas10 system. 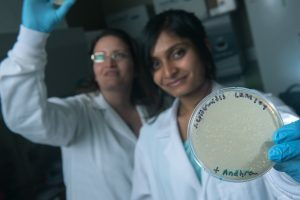 Undergraduate research assistant Vidya Sree Dandu holds a petri dish of the bacteria Staphylococcus epidermidis that shows “holes” where a phage called Andhra,which she discovered, has killed off the bacterial cells. Her lab found that CRISPR-Cas10 collaborates with other systems in the bacterial cell not traditionally thought of as taking part in phage defense. This feature allows CRISPR-Cas10 to essentially decimate invading phages, leaving no survivors. “Because CRISPR-Cas10 is so effective in battling phages, its robustness makes it an ideal system for phage genome editing,” Hatoum-Aslan said. For this project, she and her team are focused on discovery and understanding, but this work could lead to novel ways to tailor phages or the immune systems that protect against them as treatments for bacterial infections. “There are potentially far reaching applications of the work, particularly in combating antibiotic resistant infections, but before applications can be developed, it is essential to gain a basic understanding of how these defensive and offensive mechanisms work at the molecular level,” Hatoum-Aslan said. The grant also allows her to continue development of educational modules and a week-long curriculum for high schools that teach microbiology through hands-on experiments with bacteria and their phages.